Air Force Chief of Staff Gen. Mark Welsh promotes Goldie the therapy dog to the rank of major during a ceremony at the Pentagon Nov. 12. If this newly-minted major rises through the next three ranks as fast as he did the last three, he’ll pin on his first star next March. 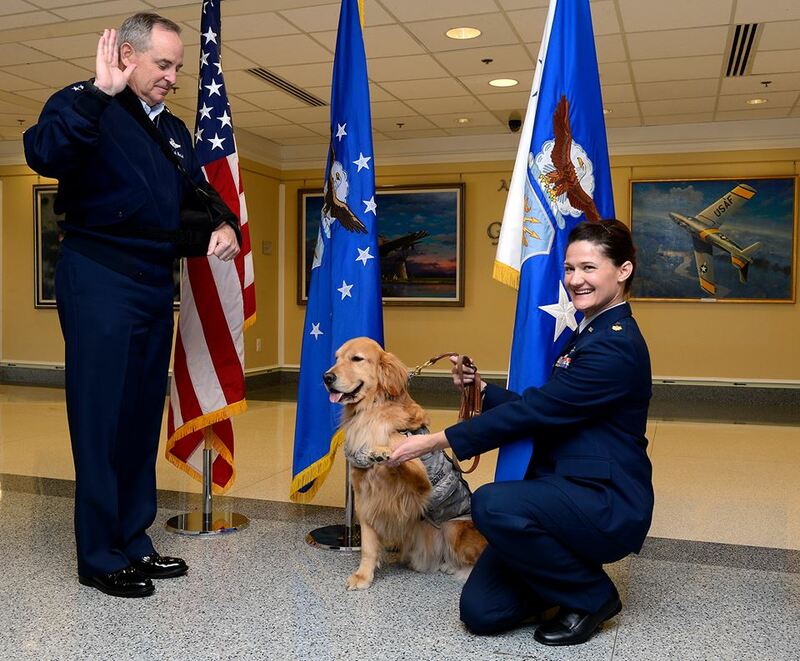 Air Force Chief of Staff Gen. Mark Welsh presided over Goldie’s “commissioning” just eight months ago at Walter Reed National Military Medical Center in Bethesda, Maryland. There, the 4-year-old Golden retriever is a beloved member of the therapy dog program, visiting service members undergoing rehabilitation. On Nov. 12, the general and the dog crossed paths again, this time at the Pentagon, where Welsh promoted Goldie from second lieutenant to major. Welsh, a dog-lover, wanted to honor the animals’ contributions to wounded, ill and injured service members in recognition of Warrior Care Month this November, Herritage said.